Outstanding location in the highly sought after Valencia Artenati at West Creek - This well appointed townhome highlights a beautiful granite kitchen with stainless steel appliances, new LED recessed lighting, tiled floors and a tremendous amount of cabinetry. The open floorplan allows easy access to your cozy family room equipped with a fireplace, ceiling fan w/light or your spacious dining room. Upstairs the 3 bedrooms are nicely situated, the master has a ceiling fan and attached master bath offering dual sinks, marble countertops, tiled floors, walk in closet and mirror wardrobes. The secondary bedrooms are generously sized with ceiling fans. One has a walk in closet and bench seating the other with mirrored wardrobes. The full hall bath has lovely marble countertops and tiled floors. Downstairs indoor laundry room with access to your attached 2 car garage with crank down storage. The inviting backyard boasts stamped concrete, flagstone seating wall, grass area, fountain and fruitless Olive and Pear trees. 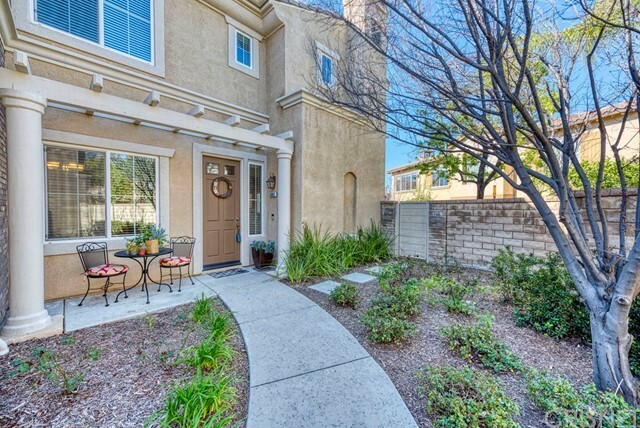 The private end of the culdesac location gives this townhome the feel of a home. End Unit with one of the largest yards in the community, this is the one you have been waiting for!